Bomarzo, the garden underworld of Duke Vicino Orsini, was created over the course of thirty-five years as a dig to the Renaissance ideals of orderliness, symmetry, and proportion. This extensive landscape folly began (c. 1552) with a conventional grotto, nymphaeum, and theatre complex and quickly deviated into a rambling menagerie of moss and lichen-covered forms shape shifting into allegorical dragons, lions, sleeping nymphs, sphinxes, and even the otherworldly triumvirate of Cerberus, Persephone, and Demeter. 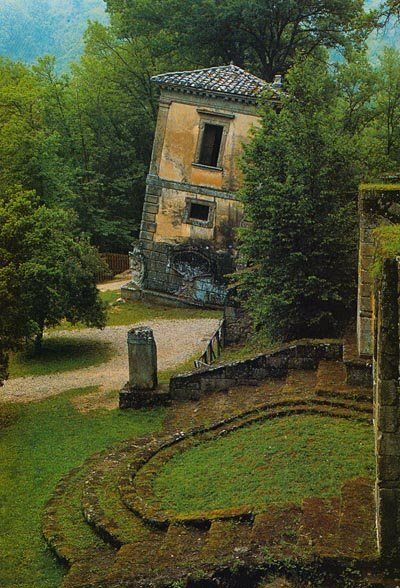 Vicino Orsini was born in 1513 to an ancient noble family with a castle overlooking the village of Bomarzo. As a professional soldier with literary and romantic infatuations, the Duke was compelled to incorporate into his garden’s design violent imagery from his personal life as well as dark interpretations of classical works and poetry. His unorthodox combination of gardening as both catharsis and irreverence makes for an odd mixture of vegetal jeux d’esprit entwined with a nightmarish descent into the terror of nature’s life cycles. 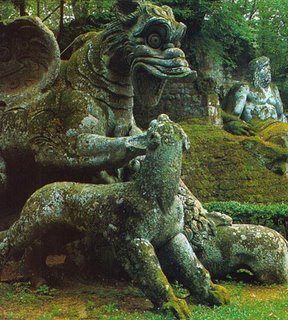 Upon visiting Bomarzo in 1949, Salvador Dali commented that he had found surrealism on a scale he could not have imagined. Sacro Bosco today is a place for unfettered discovery, marvel, and carpeted reflection. One still cannot escape, though, the presence of statuary that appears to be on the brink of historical resuscitation and gaping green revolt.